The irony is that, as mentioned above, Hurricanes owner Tom Dundon has an exceptionally team-friendly lease now, where he gets all the revenues from the arena while paying nothing in operating or capital upgrade costs, just a $3 million a year rent that he can deduct a bunch of expenses from before paying. (He’s still probably losing money on the team, but them’s the breaks when you own a hockey team in a small city in basketball country.) But leases can always get sweeter — hell, the Arizona Coyotes used to get paid to play in their arena! — and you can’t get if you don’t ask, right? There’s also the issue of upgrades to the Hurricanes’ arena, which “is in need of massive renovations that could exceed $150 million,” according to the News & Observer, citing no sources at all. The paper goes on to report: “While the building’s behind-the-scenes infrastructure has been maintained at a high level by the arena authority, public-facing areas from the arena bowl to the entrances have an understandably dated look compared to state-of-the-art arenas elsewhere.” So it really just needs a more modern paint job? A $150 million paint job? I’d think Dundon would do better asking for $150 million to subsidize his annual operating losses, but I guess if you can ask for both, all the better! This entry was posted in Carolina Hurricanes by Neil deMause. Bookmark the permalink. 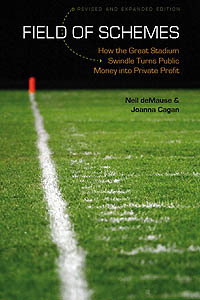 Why is it always up to the public taxpayers to make a private, professional sports enterprise “sustainable” (i.e. profitable)? He just bought the team, he’s not going to sell it to Quebecor that fast. True, but I was thinking he would threaten to move them there. Quebecor owns operating rights to the arena, and has made very clear that nobody is going to get to operate an NHL team there except them. Dundon is correct about the arena being outdated, though I am always amused that a “modern look” means fewer seats. On the move threat, I’m not sure that Dundon has the leverage he thinks he has. Houston and Quebec City appear to only be options for local owners. What’s outdated about it, Ben, in your experience? I’ve never been there. It wasn’t built in the last 15 years for one. So Ipso facto it is outdated. Kind of like the BB&T Building or Wells Fargo Capitol Center. I mean those are basically unusable right. So old! The team store is cramped and the signage, which dates from Day 1, could probably be spruced up, but that doesn’t cost $150 million to fix. I actually think it’s a better-designed arena and a more enjoyable place to experience a game than the new place in Quebec City. The Videotron Centre architects spent little time thinking about the guest experience beyond when the spectator is actually in their seat (the concourses/common areas are sort of unpleasant to be in, frankly), and the design hinders the team/tenant from generating as much revenue as they should, IMO. So it’s a good thing that the new arena in QC has so few paying spectators then. I’ve found something similar with other arenas (never been to VC or the Canes arena, whatever it’s called these days)… sometimes the older ones that were purpose built for the average paying fan as opposed to the club seat lease holder provides a better experience for the public. Certainly there is a limit.. most really old facilities have too few bathrooms and they are far too difficult to get to (you’ll miss at least half a quarter or period if you go outside of halftime/intermission)… but that has little to do with “modernity” (IE: modern fire or access/egress regs). It has mainly to do with what today’s fans are required to do at sporting events: Spend tons of money on concessions. Believe it or not there was a time when most fans going to a ballpark or arena would eat at home before they left. They may or may not have left their seats to buy a soft drink or a coffee. They definitely didn’t drop twice their ticket price on food, booze and team merch. Also, they used to bring the food to you. When I was growing up, my family would buy a ton of food at Mets games, but almost always from vendors who would come through the seats. If I understand it correctly, today you must be a club seat lessee to get the private ‘guest experience co-ordinating associate’ signal button on your Recaro outdoor seat, which you can use to order sushi or avocado toast delivery. The in stadium concessions folk used to be the ‘summer’ jobs for late grade high schoolers and university students on their summer breaks… lugging trays of beer and food up and down the stadium stairs. Nowadays the teams would like to ‘concentrate’ your spending elsewhere. I still see the occasional one wandering through the stands at some events, but nowhere near as many as there used to be. One of the reasons I tend to go to more minor league sporting events is that the atmosphere is more familiar to me… you still have vendors with (full) trays of items in the stands. At the moment Dundon owns 61% f the team with Karmonos retaining the remaining 39%. Dundon may opt to by the rest in 2 years at whatever the franchise value is at that time and make a carte blanche decision that affects the future of the franchise. It’s interesting that Karmonos has repeatedly cited the existing favorable lease as a reason why the team wouldn’t move, but apparently he didn’t ask the opinion of the new owner as he took the helm. Houston is probably the most likely landing spot for the Hurricanes considering Dundon is a Texas native. It’s obviously a huge market though he’d likely have to share the arena with the NBA Rockets. Now that Seattle has been awarded an expansion franchise, look for the them to move to Houston if Arizona or Florida doesn’t hop there first. League revenue sharing has helped this team survive in Raleigh for this long, something Hartford was not privy to since it was implemented after the 2004-2005 lockout, but the NHL still lacks a lucrative league wide television deal to generate stability. Maybe, just maybe, the lack of an NHL franchise helps us land the Major League Baseball team the area really wants. Ok this made me laugh! Do you really think Major League Baseball would go to Raleigh?